On the 4th July 2013 commemorative Guernsey £1 notes was issued to mark the 200th anniversary of Thomas De La Rue's first commercial venture. Guernseyman Thomas De La Rue's name is synonymous with the printing of money around the world - and this commemorative Guernsey £1 note has been issued to mark the 200th anniversary of his first commercial venture. The commemorative note is the same as the existing £1 note but is enhanced by a special design featuring Thomas De La Rue on the reverse of the note. It is also the first series of £1 notes to feature the signature of States Treasurer Bethan Haines. The notes also have a special prefix - TDLR - replacing the usual letter prefix. The Thomas de la Rue £1 note has an issue limit of just 300,000. The commemorative notes will circulate alongside the existing notes. The total face value of all Guernsey notes and coins in circulation is just over £44.2million, of which £33.5million are banknotes. £3.4m are £1 notes. 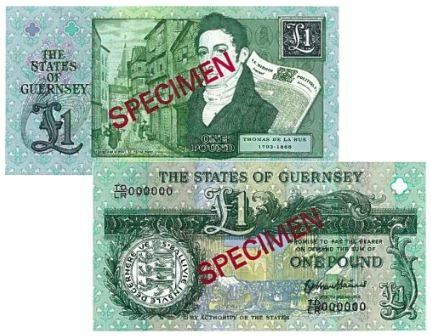 Guernsey £1 banknotes were first issued in to circulation in 1816. In 1980, the De La Rue Company printed £1, £5, £10 and £20 notes for Guernsey for the first time.